Wooden wardrobe, already here when I move in. Finally I have a wooden wardrobe again, to keep my clothes. As an adult, we can't live without the mirror right? So bought a long mirror to put in my room. Book rack to put some books. Now they not need to live inside those bags already. 20" Samsung LCD monitor, everything become wider now. Better visual when watching movie, but I have not many time for movie. Went to watch Transformers 2 on Wednesday midnight. I had waiting for it for two years, finally it release. Wonder will it have Transformers 3? When will it be? I guess it will still continue, good job Micheal Bay! I bought a "Transformers" for myself also. See below. This is my drinks, Almond Latte. Left side is before stirring, right side is after stirring. It is nice, I can feel the strong almond taste in the drink. Hue Min ordered Hazelnut Latte, her drinks is nice too, with hazelnut taste. I tried a slip from it, nice hazelnut taste. But I wonder why she say she can't feel the hazelnut taste. This is Win Naa drinks, Passion fruit tea. Guess it is nice too. Will order next time when next visit. Nasi Lemak Rendang Ayam. Ordered by Win Naa. Forgot to ask her about it after eating. Seafood sambal fried rice. Ordered by Soon Aik. The ingredient of it are prawn, sotong, got lala somemore. I know it is delicious although I didn't taste it. Nyonya Lemak Laksa. Ordered by Hue Min and me. Well, the taste is thick, suitable for people who like to eat heavy taste Nyonya Laksa. My desserts, black glutinous rice with durian. Delicious dessert. The durian taste are too strong, make me cant feel the desserts taste after eating some of it. It is better to mix the durian together with glutinous rice for good taste. It gettting tastier after I mixed them. The food of here are nice. Just wonder why the waiter keep moving the tables and chairs behind while we are having our meal. We quite annoyed with the sounds. The house suitable for coffee lover, it selling various type of coffee. You can have the coffee with or without Haagen-Dazs ice cream. You can also get 15% off for the coffee when you order at the teatime during weekdays. 2 weeks had gone, the sem break is going to pass soon. Went Times Square on the way back to Melaka. Mazda roadshow with some hot models. Have my short lunch, as time is not so enough for me. Only 3 hours included shopping in Times Square, buying stuff in Low Yat, plus lunch. Sweetchat Cafe at Lower ground of Times Square. Lets start with the drinks. I order Iced White Chocolate Coffee as it is unique with the word 'white chocolate'. This is the drinks. I only can say 'what the heck' for this. The taste is not consistent with its name. You called that WHITE CHOCOLATE coffee!? Yes, it does taste like coffee, but where is the white chocolate taste? 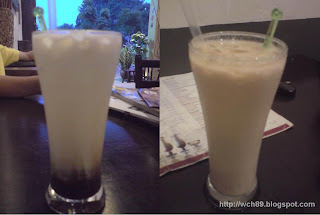 The taste is almost like ice cappucino. As a coffee drinker, I don't care spend some money to enjoy the coffee.But this is not what I demand for. I ordered it because it was recommended at the 2nd page of menu. Plus it looks great, so I would consider a try on this. Only one word can describe it when I put it into my mouth. WONDERFUL! The durian inside the pancake melted in your taste bud when you put into your mouth. You can feel like the a durian blust inside your mouth, great! The bill end up like that. Just feel that the coffee with that taste is not worth paying with that price. Seriously, I rather add few more bucks to get a drink at Starbuck. Ok. Lets see what I snapped today. Okay, guess what? Choon Hong is available in Teluk Intan now, for a limited time only. Hooray! Finally the month of June has reached. We have been waiting this month for 2 year. The revenge is coming. 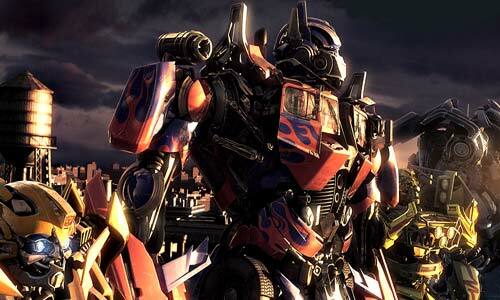 Transformers 2 will be in cinema on 24 June 09. I bet that will be the best movie of the year. Argh, I can't wait it anymore. Chevrolet's car continue appear in Transformers 2 with 3 more extra cars(the silver colour not in the picture). Guess Chevrolet will continue earning money by promoting their car in this movie. There is a part of humor inside the trailer. It is in the conversation between Sam's parents. I quoted it. Mum : Look at this place! I feel smarter already. Can you smell it? Dad : Yes, smell like 40 thousand a year. "We are here, we are waiting"